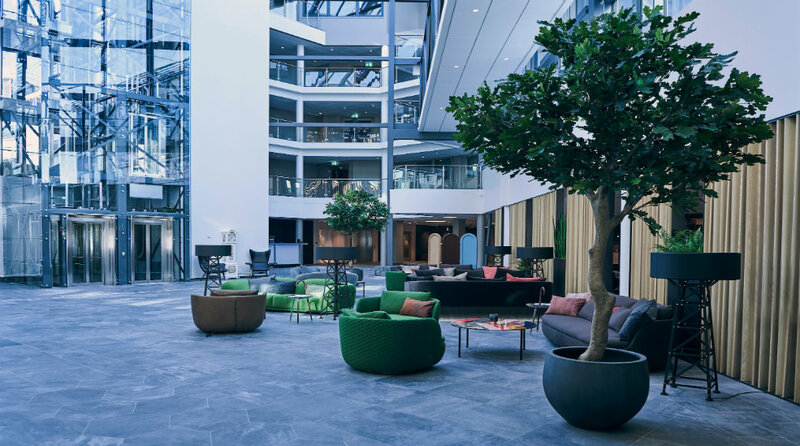 Welcome to the Quality Airport Hotel Gardermoen, a full-service, cash-free conference hotel that reopened on 15 March 2018 following extensive renovations. Guests can look forward to stunning natural surroundings just a stone's throw from the airport! The Quality Airport Hotel Gardermoen is one of Norway's leading conference and training hotels. And it's the perfect place to come for a holiday too! The hotel has recently undergone extensive renovation and expansion by an extra 7000 sqm. This means that we are now able to welcome up to 800 conference guests in our largest meeting room alone! Our 455 stylish hotel rooms feature Scandinavian décor and great facilities to help you enjoy a relaxing stay. Come to Brasserie X for a great meal or head to "Granbar" for a delicious drink! Our stunning atrium allows daylight to flood the modern lounge area creating a unique atmosphere. This is a great place to sit back and gather your thoughts before a meeting or your next trip! Our location is ideal for conferences, as we located just 45 km from the centre of Oslo and 8 minutes by shuttle bus from Oslo Airport Gardermoen. We are surrounded by forests, and there are some fabulous cycling and running trails to allow you to clear your head at the end of a long day! You can also swim in the summer and ice skate in the winter just 5 minutes' walk away from the hotel. Jessheim's town centre is situated 2.5km from the hotel and offers a wide range of cultural experiences, a cinema and great shopping. So, the Quality Airport Hotel Gardermoen offers much more than just proximity to the airport. we will be an ideal venue for both small meetings and large-scale conferences for up 800 people in our largest room. Vi kan tilby en helt rå logistikk med korte avstander hvor du finner alt på ett plan. With 455 double rooms, a total conference capacity for more than 1000 people and close proximity to both Oslo and the airport, we will be more than well-equipped to host fabulous conferences and events. Our Sweet Dreams Stay project is a collaboration with UNICEF to help children subjected to human trafficking enjoy a safe night's sleep. You can help by choosing not to have your room cleaned when you stay with us more than two consecutive nights. We will then make a donation to UNICEF on your behalf. The Quality Airport Hotel Gardemoen is cash-free, providing added security for our guests and visitors. You can find out more information about this under FAQs. Airport train (express train) to Gardermoen or local train to Jessheim.